It was one of those days when Mr. K and I left the house with two lists: places to go and things to buy. 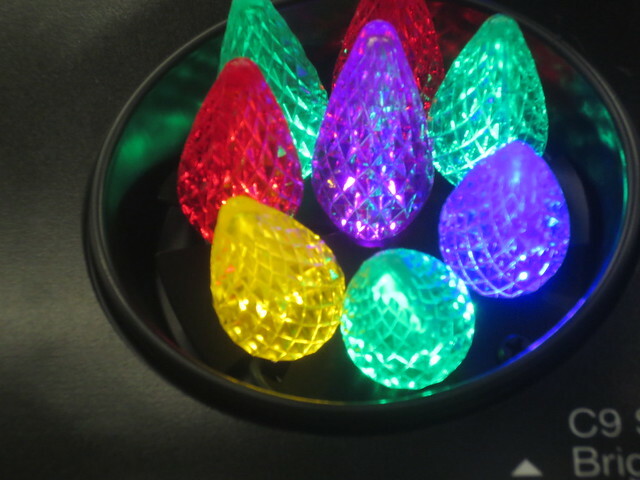 Our first stop was Home Depot, where I immediately got distracted by the Christmas clearance stuff, even though about 90% of my current Christmas decor never made it out of boxes this year. Fortunately I managed to not buy anything, though if the LED lights in the display were not all sold out I’m not sure that would have been the case. A couple more stops and then it was time for lunch (and pie). The restaurant we wanted to eat at was closed for an extended Christmas holiday, so we went to another one nearby that we’d avoided for five years because we weren’t too impressed with the pie there (this at a place with pie in the name), but it was open today and we thought we’d give it another chance. After dessert, we decided we’re good for another five years at least. 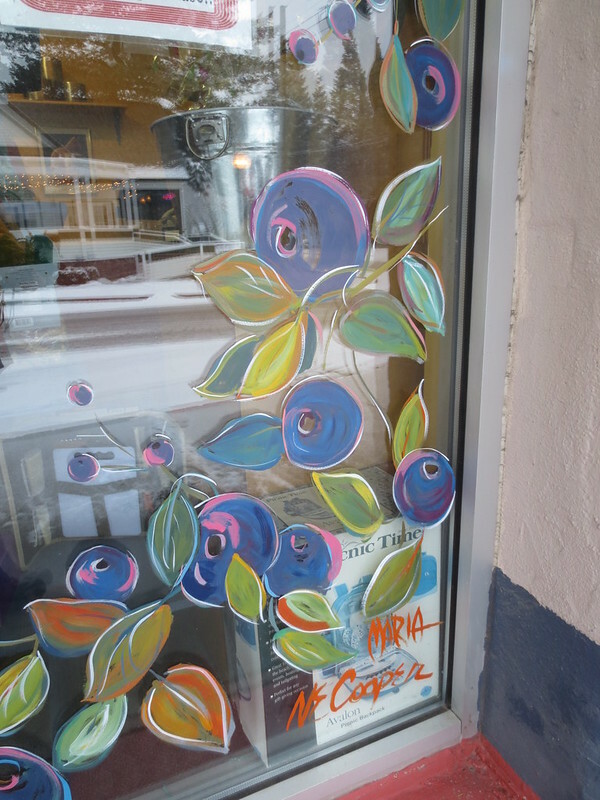 The upside was stopping in a shop next door which had some pretty window art. Bellies full, we were ready for grocery shopping. 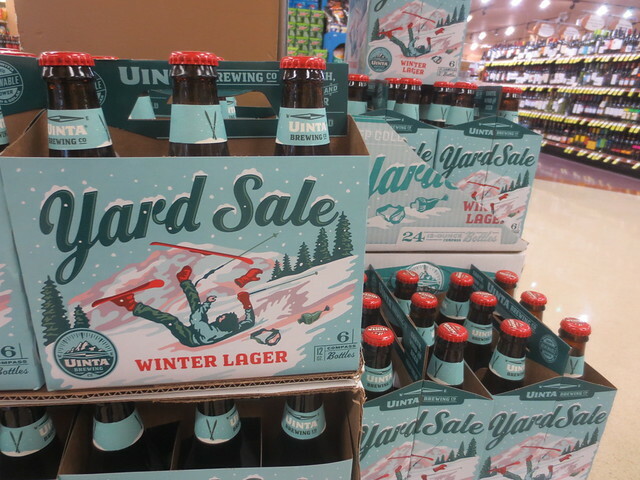 They had a big display of Yard Sale winter lager, which amused me, but not so much that I bought any. I’m not sure it’s good karma for a skier like me to have such a thing in my house anyway. 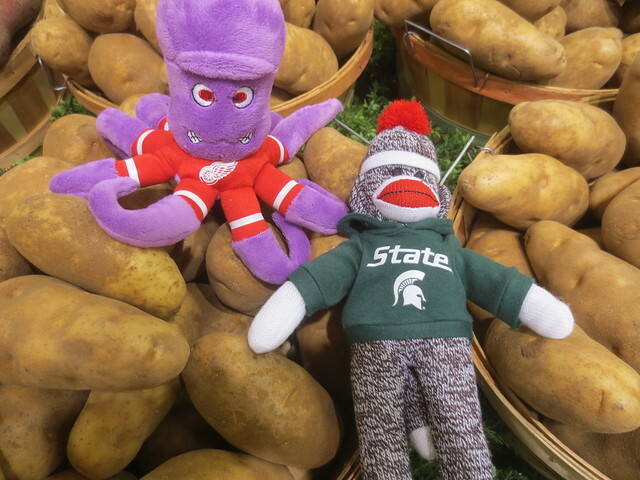 Stanley and Sparty Monkey helped me pick out potatoes in the produce section. One more quick stop and we headed home to tackle the list of things to do before we have to go back to work. Laundry ho!